Having the opportunity to speak with Julia Butler at Book Expo America this year served as a wonderfully engaging opportunity to converse with a writer that is making her first literary foray into the world of publishing, through the means of self-publishing, with her first novel “The Last Encore.” Among the many interesting morsels of information she divulged about her novel, she said the story was drawn from true events. Additionally, she enticingly referred to the important, controversial psychological phenomenon at the core of this novel’s ingenuity in very non-explicit details, by referring to it as a psychological phenomenon that is very well-known in Europe, more so than America. More importantly, the story was deeply inspired by Beethoven’s very moving, very somber, though delicately tragic composition Moonlight Sonata. This piece proves to be a very essential poetic force in the novel, offering readers a deeper glimpse into the rich, underlying nuance that really suffuses the whole of the novel with a lot of depth. Yet as with Kate Morton or Madeleine L’Engle’s works, Julia Butler writes with a rich mastery of subtle language, which she uses in effect to hoodwink us into believing one thing temporarily, before throwing a sudden counterpoint in the forward progression of the novel, causing the reader to never have a very clear idea about what is happening. The language in this book is exceptionally well-refined, meaning that there are no moments of pedantic prose that ponderously lures the reader to sleep. Rather, the effectively clear, though deftly descriptive prose unwittingly pulls the reader’s entire mind- conscious mind and subconscious mind- into the story’s unrelenting flow of tawdry drama and salacious secrets. During our conversation, Julia Butler mentioned that she worked diligently on editing every word of the novel, till everything flowed perfectly, in a way that the progression of the sentences never was stultified by careless prose. This novel has ample evidence of this type of meticulous labor,as the novel’s captivating story catapults the reader into an ephemeral work of art that accurately represents the whole gamut of human emotions, including the volatile nature of human passion and love. Certainly, there is a particularly important plot point that will prove to be very divisive for readers, but it is something Julia Butler handles with great authorial care. She never becomes trapped into sentimentality or incidences of gratuitous description. Rather, she is very careful with approaching the emotional sensitivity of this issue, and really allowing his subtle prose to provide the reader with enough insinuation about the deeper psychological dimension of this particular relationship, and slew of other relationships that work in dramatic tandem with one another. Also, Julia Butler mentioned that you do not need to be well-versed in the jargon of music to grasp the deeper meaning of the story, yet for a literary critic the unorthodox way that musical terms finds themselves into her novel does seem intentionally done. Creatively, each chapter utilizes a different musical term and each seems to chronologically envisage the structure of the novel, at least in the reader’s mind, as a musical composition. Another talented writer, Anne Rice, has written two noteworthy books-Violin and Cry to Heaven– that straddled the blurred artistic lines between the ways that the seemingly divergent types of artwork, musical composition and writing, both are either similar or different. On a linear level, the terms that define the various methods used for either form of art may be radically different, but their role within either a novel or a piece of music similarly are used to elicit deep emotions within the audience. It is Julia Butler’s way of displaying the shared artistic merits of exceptional writing and music. These are two things that can help to have a greater understanding of the deeper, underexposed territory of the human psyche. Novels, such as The Last Encore, open our hearts and minds to things that we rather relegate to the region of “unacknowledged human phenomenon” till we think it no longer exists in our immediate reality. With the way this story is written, there is no way for the reader to escape various questions that arise upon reading the novel’s shocking ending. Impressively, the ending of the novel leaves the audience suspended in the silence The following quote from the wise religious scholar, Karen Armstrong, may be talking about the most important aim of skillful theology, yet it aptly describes the sensation that accompanies the shocking ending of this novel. Brilliantly,this quote from Karen Armstrong brilliantly reflects the same ineffable feeling of awe or mendicant silence that seems to accompany a very thought-provoking novel: the type of masterful novel that never condescends to provide the reader with easy explanations for the various difficult issues or conflicts that arise in our lives. Rather, the skillfully novelist should immerse themselves in letting their minds be the conduit for ideas that are spilling forth in an abundant overflow of artful ideas, which the writer struggles to both consciously and unconsciously put together in some coherent reconstruction that serves as the novel. Not all writers work this way, and those writers are not necessarily bad writers, but writers like Julia Butler behave more like the type of musicians and artists that are always willing to write without deliberating too much on the audience’s expectations, or trying to write something to fit a tight marketing scheme or appease a certain type of audience. 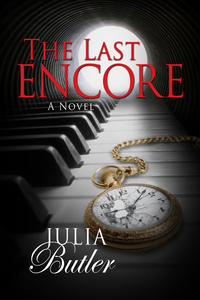 Rather, The Last Encore is the type of book that trusts the reader to experience the book firsthand for themselves, and it never audaciously or retroactively fills in the various narrative ambiguities that arise during the course of reading the book. Instead, the questions that this text admirably generates in our minds is yet another product of Julia Butler’s fantastic writing. At first, I had a bit of trouble with engaging with the text, as I didn’t really like some of the characters at first, and I didn’t trust that the author would ultimately deal with all the core conflict of the novel in a satisfactory way. I even felt like the dialogue, at times, could be a bit artificial and stilted. But, you must be patient with the structure of the novel, and reserve your final judgments about the book till the end. By the end, you will want to got back right to the beginning, and experience the full sweeping, highly emotional musical sonata that this piece of writing represents. There are certain key characters traits among some of the character and even words either used to describe some of the characters that come back again. By the end of our conversation at Book Expo America, I came away stunned, by Julia Butler’s tenacity and clear dedication to the vision of her fictional works, and she wanted the readers of this blog to know that she really cannot wait to read your reactions to this novels. With that said, you should really consider reading it, if you love books that are never stagnant, but instead rely on a sharp focus on conveying the psychological nuances of the various complex characters that are key players in this wonderful novel. If you love books about family secrets, forbidden passion, or anything that ventures into subversive territory, this may be well up your alley. As a reader that was quite blown away with this novel, I really look forward to more novels from this promising new novelist, who is certain to be beginning a very fortuitous career in writing! She has a lot of potential, and I hope readers give her the opportunity to explore more interesting, even puerile areas of the human psyche (areas seen as taboo and better left never being explored honestly). These are areas that even professional writers often do not explore, and for Julia Butler to enter it with so much temerity and care really reflects very well on her as an artist. I look forward to a potential sequel, and any other subsequent novels from Julia Butler. For now, I’m left with this strange, uncommon desire to re-read the book, as once just really wasn’t enough for me to really appreciate this book. Thanks again Julia Butler for both providing this blogger the opportunity to speak with you, and share your wonderful work of art with the many avid readers that actively read this blog! Previous Post Enter Fickle Fish’s Contagiously Clever Instagram Giveaway, and Win a Bevy of Books!